Sweet Peas demonstrates a close study of nature, though the plants have been carefully arranged for decorative effect. Green leaves alternate with pink and purple blooms, and delicate shoots tie the composition together. 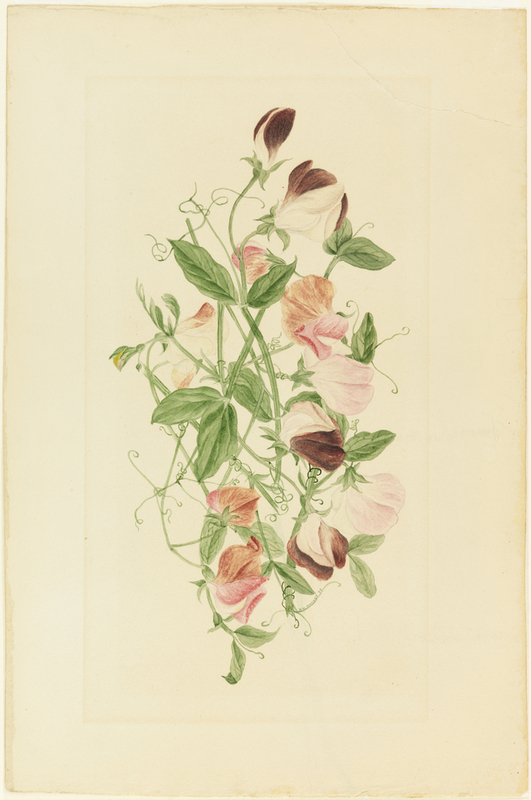 Henrietta signed this lively botanical study in minute letters along one of the lower tendrils. Watercolor, as a medium, was gaining greater respect in the United States in the 1870s. Previously, it had been associated with the genteel accomplishments of ladies who designed embroidery and china patterns, decorated place cards for the dinner table, and painted larger pieces to adorn the parlor. Perhaps because of its feminine and amateurish associations, professional painters—like those in the Hudson River School—resisted the medium. Professional organization like the American Watercolor Society, founded in 1866, helped to bring critical attention and patronage. Watercolor exhibitions became a more egalitarian space where women, as well as designers, architects, illustrators, and other commercial artists, could show their work. In addition, watercolor exhibitions offered a venue for younger artists—like Winslow Homer—to make a name for themselves. Winslow Homer would go on to become one of the best-known American watercolorists. Cooper Hewitt, Smithsonian Design Museum is home to more than 500 works by Winslow Homer, including watercolor renderings of a ship wreck in the Bahamas (a study for The Gulf Stream), a solitary fisherman, and a hilly landscape. Our museum is also one of the few that can showcase Mrs. Homer’s talents alongside her son’s. Laura Fravel is the Curatorial Research Assistant (American Art) in the Drawings, Prints & Graphic Design Department at Cooper Hewitt, Smithsonian Design Museum. Clark S. Marlor, A History of the Brooklyn Art Association with an Index of Exhibitions (New York: J.F. Carr, 1970), p. 230. For more on Henrietta Benson Homer, visit the Henrietta Benson Homer Archives, Bowdoin College Museum of Art. To learn more, see Kathleen A. Foster, “Women and Watercolor,” The Magazine Antiques (March 3, 2017).